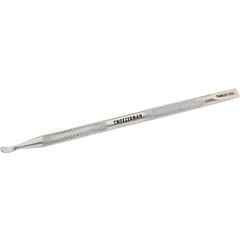 This stainless steel two-in-one tool combines the Pushy cuticle pusher with a convenient nail cleaner. Super-thin edges are buffed smooth to prevent scratching, while the textured body gives you a secure grip. To use: Rub ample amounts of moisturizer or cuticle cream onto clean nails and hands to gently soften skin and cuticles. Soak hands in a bowl of warm water with your favorite essential oil or Epsom salts. Gently clean under and around the nail using the fine end. Use the Pushy end to delicately push back cuticles. Retinol Day Cream with SPF 20 is specifically formulated to combat the visible signs of aging….